FAR from the madding crowd. Arriving at an upscale portion of 6 October City is curiously like reaching the end of the world. Stepping off the 26 July Corridor, one has the persistent sense that one is still on the highway: such is the sprawling, insular abundance of tarmac, the precisely geometric arrangement of one- or two-storey buildings (clusters of which are painted red, green, blue), the under- construction atmosphere and the sense of impending isolation. Though the freshly paved streets wind on and ahead to seeming infinity, it is hard to imagine anything lying beyond the concrete grasslands that make up this place. Neither urban nor rural, the Sheikh Zayed housing complex, despite the fresh air, occasional green and wide open spaces, does not quite manage to be alluring -- perhaps a testimony to architectural ineptitude, but most likely a function of the lack of history, a condition that does not seem to impinge on Sawsan Badr's choice of address. "I fled from the city," she explains. "That city of yours is impossible and if it was up to me I would never go there, ever. When I first arrived here, you know, I would walk in and start yelling at the construction workers. Their demeanour struck me as infuriatingly calm, and they would ask me politely to relax, swearing that everything would be all right. Why was I like that? There was really nothing to get worked up about. There was only the fact that I had left Cairo behind. It is amazing how much tension builds up after spending even an hour in Cairo. My only concern is where I will go when the city starts catching up with me." She surveys the surrounding emptiness and heaves a sigh of relief. Inside the house, one gets a sense of the meticulous care with which she constructed her unique place under the sun, far from the madding crowd. The interior is decidedly "modern Eastern" in style, reminiscent of the work of Hoda Lutfi and Azza Fahmi, among others: there are wooden archways and green, dekka-inspired armchairs, many-sized cushions with delicate Oriental patterns on the covers, and a sweet, cross-eared dog undergoing detention in the adjoining room. In the next few hours, the dog will sneak out to greet us, in the vain hope that he might be admitted back to human company. Admonished, however, he will slink away immediately, in palpable disappointment though without so much as a yelp of protestation. "He did something terrible this morning," Badr finally confides. "I will bring everything out now so that we don't have to interrupt the conversation to fetch a drink," she insists; and minutes later, indeed, the small coffee table is laden with hot water, tea, coffee, soda and snacks; in the meantime the photographer has choreographed the seating arrangement to suit her needs, and I am still fumbling with my recorder. Badr, with only the most minimal adjustments to her appearance, makes a few more journeys to the kitchen before she takes up her designated spot. She looks stunning. What does not kill you makes you stronger. "Yes?" she looks me square in the eyes, as if we are about to start a duel, but almost immediately the harsh expression dissolves into something more like mischief and she smiles. Death of a Princess, a British film about the execution of a Saudi princess produced in 1979, was not her first achievement, she clarifies. Prior to making this dubious career move, she had worked on two successful television serials: Ahlam Al-Fata Al-Ta'ir (Dreams of the Flying Young Man), with Adel Imam, and Heya wal-Mustahil (She and the Impossible), directed by her friend and mentor In'am Mohamed Ali. "People remember these roles to the present day," she beams. "My coworkers were established masters. It was all very worthwhile." Almost contemporaneously, too, there was Habibi Da'iman (Always My Love, released in 1980), starring Nour El-Sherif. "This was a very good role," she recalls, the beginning of her career in cinema. "After Death of a Princess, life stopped completely for four years." She adjusts her position on the seat. "We had a friend called Hossam Ali, who was the executive producer in Egypt. Most of the film, by the way, was shot in Egypt -- part of it in Lebanon, part in England. They were looking for a girl to play the lead, the director apparently was not convinced by any of the actresses he had auditioned. Hossam called and said, 'If you're free, let's have tea together in the afternoon.' And there, unexpectedly, I found the director with him. Before too long Hossam broke the news to me. I trusted him as a friend -- and I was quite inexperienced at the time -- so I agreed. But it was clear that we all made a mistake, all the Egyptians who participated in the production, though nobody knew exactly what it was." Offended, the Saudi authorities were unrelenting, with distributors refusing to buy films in which those who had participated in Death of a Princess took part. Badr explains that, the Gulf countries being the Egyptian film industry's most lucrative market, no producer would risk employing the blacklisted parties. She sounds almost apologetic, though she repeatedly insists that she has no regrets. "The film caused a huge fuss, as you know, and the result was that I, along with everybody who worked in the film, stopped working for four years." This was a period of depression -- of purposeless activity and social decline, of personal disillusion, isolation and divorce -- yet Badr, typically, is careful to point out that it wasn't without its bright moments. "I entered into one commercial project after another and failed miserably in all of them. I knew that the only thing I could do was to be an actress, the only thing I was good at or had any talent for was acting, so when that was taken away from me, I felt lost and didn't know what to do with myself." She stops to light a cigarette and take a meditative sip of coffee. "I gave birth to my daughter, Yasmine," a business administration student who makes a few pleasant interruptions on her way out. "I learned English and took to reading -- very intensively. It was reading that eased me out of my depression. And I did not regret the experience, no. In fact, it was a delightful one." 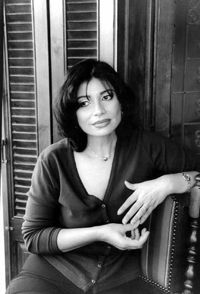 She had made some indispensable connections: Salah Jahine is not the only coworker she remembers with affection and gratitude, and the "Western system" of production, the like of which is to be found nowhere but in Youssef Chahine's production company, Misr Al-Alamiya, made an indelible impression on her psyche. "Your status as an actor doesn't matter in the least, and everything is arranged so that you arrive at the set in the best possible frame of mind, so that you can make the best possible contribution." She also graduated from the Institute of Theatrical Arts in the same year, and though work was not forthcoming, artistic and intellectual growth were already underway. "Some of our friends had influential connections in Saudi Arabia." Eventually, after so many years, she was taken off the blacklist. "It was a major setback -- I watched in silence as lesser and younger actors made their way to stardom while I stayed home -- but it wasn't the end of me, let's remember that. It made me aware of what could be gained from a bad experience. I've always been a great believer in the idea that a blow that doesn't kill you, however devastating and harsh, can ultimately only make you stronger." Since then, she has regained her prominence, making an indelible mark on her contemporaries and working with some of the best actors and directors of our times. In the young filmmaker Atef Hetata's recent Al-Abwab Al-Mughlaqa (Closed Doors), her remarkably honest portrayal of a professional woman solicited wide-ranging praise; and her current project, Mohamed El-Qalyoubi's Ibn Mawt, has already figured in the press. Theatre is the father of all the arts. "The first meaningful work after my four-year hiatus was El- Wad Sayed El-Shaghal (Sayed the Servant Boy) in 1985," Adel Imam's long-running stage comedy, and for many years, due largely to Imam's phenomenal popularity, the highlight of the commercial theatre scene throughout the Arab world. "A good role, an excellent cast: simply by virtue of being next to Adel Imam on stage, I was learning. The benefits are manifold," she points out: "You learn to arrive on time, to respect the discipline of the theatre, to respect the audience and to be mindful of what might offend them. Adel would explain that the dialogue was not Holy Scripture, we could change it as the occasion demanded. But never should anybody make the slightest allusion to obscenity or the subtlest improper remark. The challenge was how to make the audience laugh without parting with your respect for them, for the families who were there to see you. And Adel Imam knows exactly how to engineer a joke that's innocuous and hilarious at the same time. There was, to boot, an atmosphere of camaraderie, friendship and love..."
For Badr, working on a television serial or a film is comparable to a pleasant romantic affair: there is understanding and enjoyment but little passion. Theatre, by contrast, is true love, "the truest love of my life." As a child she accompanied her mother, a National Theatre actress, to various venues, where she would be positioned backstage within sight of the performer, lest something should go wrong in the course of the play. "Sometimes I watched the actors, sometimes the lights. I smelled the wood, the curtains. I took in the whole atmosphere, and to this day it remains the ultimate bliss." Entering into the role, she insists, is a process almost of hypnosis. "So much so that, after the curtains are drawn, it takes a while for me to come back to my senses. People who talk to me might not notice anything other than the fact that I seem a little distracted, but actually, for a while, I am in an entirely different world, I am the character I was just playing, and only later do I regain my normal tics and personality traits." Then, she says, there is the immediacy of the response, "the feeling of connection with all those people who are there for you to make them laugh, to make them cry," to exercise your powers over them. "I can quite honestly compare the experience of being on-stage to meeting someone you love." In cinema and, to a lesser extent, television, "you have to return to yourself too often: you are expected to interact with others and answer the phone so your husband can tell you off about dinner not being ready." The long, exhausting hours make immersion impossible; the audience is far away; hypnosis is never quite complete. Badr has fond memories of many plays; too many: Fathiya El-Assal's Sijn Al-Nisaa (Women's Jail), and the Syrian playwright Saadallah Wannous's Tuqous Al-Isharat wal-Tahawwulat (Rites of Signals and Transformations) are but two memorable examples. The first she sums up as "a prison ward in which there exists every kind of prisoner: the political activist, the girl who was mistaken for a political activist, the woman who stupidly got herself convicted without committing a crime, the thief, the prostitute, the murderer. And you get to see the development of all these paradigms, the reasons why women fall into these various traps. A beautiful play that I learned a lot from: it made me consider extreme life situations and made my mind work in new and interesting ways." The place of women in society: that was the essential idea behind Wannous's classic. "What we make of religion in society and how we perceive women in this context. Can a woman in an eastern society choose freely? And if so, to what extent?" Rebel with a cause. Badr, a woman in an Eastern society, has chosen freely. To what extent is a question she seems to answer with persistent ambiguity. As a mother -- the one experience that truly changed her outlook on the world -- she has been forced to assume a position of authority, to represent the patriarchy, as it were, having laboured under the weight of it herself. Take for example her family background, an aspect of her life that explains why she enrolled in the Faculty of Science at Cairo University long before she attended the Theatre Institute. "Although my parents graduated from the Institute -- my father as a critic, my mother an actress -- ours was a staunchly conventional family. I wasn't my mother's friend, the way I try to be my daughter's friend; and though my father was tender he treated us all in a very 'official' way, occupying his post as a traditional father. To this day my mother has serious reservations about the way I bring up Yasmine and the (limited) freedoms that I allow her." The thought of their daughter becoming an actress was quite naturally out of the question. Yet as a child, listening involuntarily to her mother learning her lines, she too learnt them. "I would stand before a mirror and recite the lines to myself -- all the time -- until people started saying I would go crazy." She never attended classes at the Faculty of Science; and because "you can rebel, of course, but only if you have a very good reason," she enrolled in the Institute without her father's knowledge, marrying early, one suspects, at least in part to legitimise her new life. "I tried to bring my daughter up with as much freedom as possible, teaching her to make her own independent decisions. Very often we are friends and we have conversations about our respective private lives, but we've had major fights and thrown vases at each other and everything. All the time, while giving her the freedom I felt she deserved, I was watching. Because however much you want to break the rules and float upwards, there is always a ceiling into which you must not bump. In a society like ours, you have to be alert while bringing up a girl -- and alert I have been. But my own experience gave me a useful, sympathetic perspective as well." So one must have a very good reason to rebel; but perhaps, accommodating, warm, responsible and conscientious as one is, one was not meant to be a rebel in the first place. However emotionally volatile or passionate about her work, Badr, far from being a social misfit or an ardent proponent of change, gives an impression of sedate, well-adjusted stability. Gregarious (her friendships span the breadth of the cinematic and theatrical community and beyond, ranging from Farouq El-Fishawi to Ahmed Rateb, from Sahar Rami to In'am Mohamed Ali), homebound ("I hate flying so much if I could raise a camel to convey me abroad I most certainly would; there is nothing like being bound up with a specific set of people and a place, a home") and consistent (her work may have exposed her to such a wide variety of life modes she is "never shocked by the behaviour of human beings," and yet she remains, faithfully and honestly, who she is): Badr manages her many-hued affairs with a firm grip and an ability to cope with disaster. "One's relationship with God is a very private affair," she begins, answering a question about her brief spell of religiosity, when she took the veil and retired from public life. "My relationship with God is very private. The reason I took the veil is very private," she continues. "And so is the reason I took it off." So intensely focused is her line of thinking, so persuasive and serious her tone, that it takes me almost a minute to realise that what I am getting is not an answer to my question at all, but rather a saddening, inflexible "no comment."